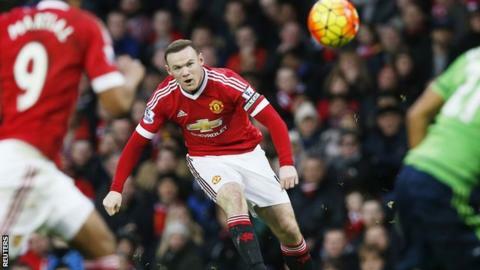 Wayne Rooney has set his sights on passing Bobby Charlton's record tally of 249 goals for Manchester United by the end of the season. Rooney is currently on 243 goals and admits he is "aware" of nearing the landmark. "I think it's been a good start to the season personally and it's great to be mentioned again alongside Bobby's record," Rooney said. "Hopefully before the end of the season I can go past that and kick on again." Rooney overtook Charlton as England's all-time leading goalscorer in September when he scored his 50th goal against Switzerland - and he says he is used to the media scrutiny. "Like the England record, when I was getting closer, it kept getting mentioned every week so that will probably start again with every goal," he said. The 30-year-old has started 2016 in a rich vein of form for his club, scoring six goals in the first six matches, with his latest coming in a 3-1 FA cup win against Derby on Friday.